The first order of business was to find a base to mount everything onto, luckily I tend to buy wooden plaques and keep spares of various sizes on hand, just in case. After a quick search, I found a nice round one that actually fit the ship perfectly. After a bit of prep work, I stained it with a red mahogany stain and the following day sprayed it with polyurethane. I used an old jar lid to leave some of the wood exposed, since glue sometimes doesn't like to stick to varnish. From there, it sat for a bit, waiting for me to finish my squad of Skitarii Rangers and once Monday rolled around I decided that I would begin working on it during our show. 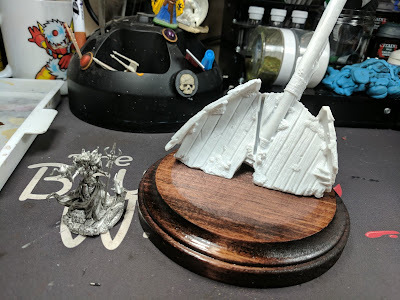 First things first, I pinned and glued that ship to the base. 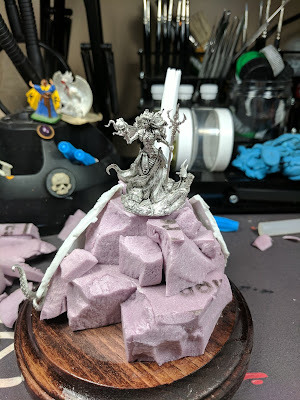 Then I started working on adding rocks to the base. Normally, I would use cork for this but I didn't have enough of it on hand. So I opted for pink foam instead. I'm not a huge fan of pink foam. Sure, it cuts nicely and when you break it it simulated rocks fairly well. But you can't super glue on it, white glue doesn't seem to like it either, so your only option is to use hot glue. Most of the stream was dedicated to the puzzle that was rock building. It is always an interesting challenge, as I wanted it to look random enough, and at the same time have a good composition. Following the build, I used air dry clay to hide the pink foam a bit more. 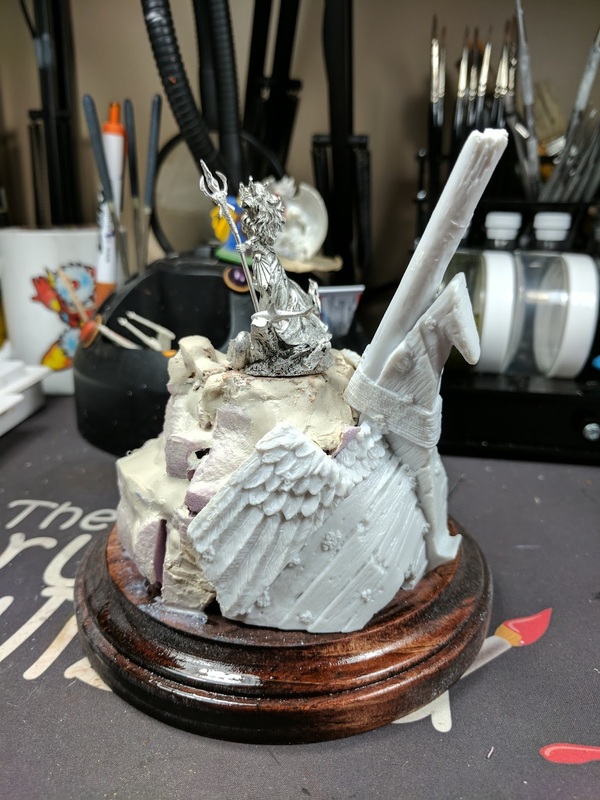 Unfortunately my clay is old and drying out and was tough to work with. I found myself deforming the foam while trying to get the clay to adhere to it. While working on it, I was definitely kicking myself for not using cork. But it turned out ok so far. With the clay on, it was time to let it dry. 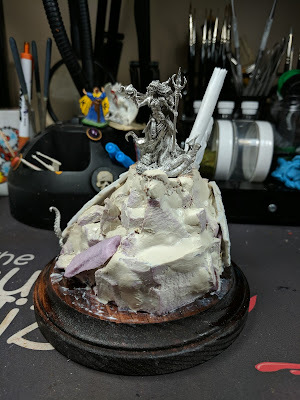 The drying process will cause the clay to crack a bit, so before I can continue I will need to layer it with some white glue to hold it all together. 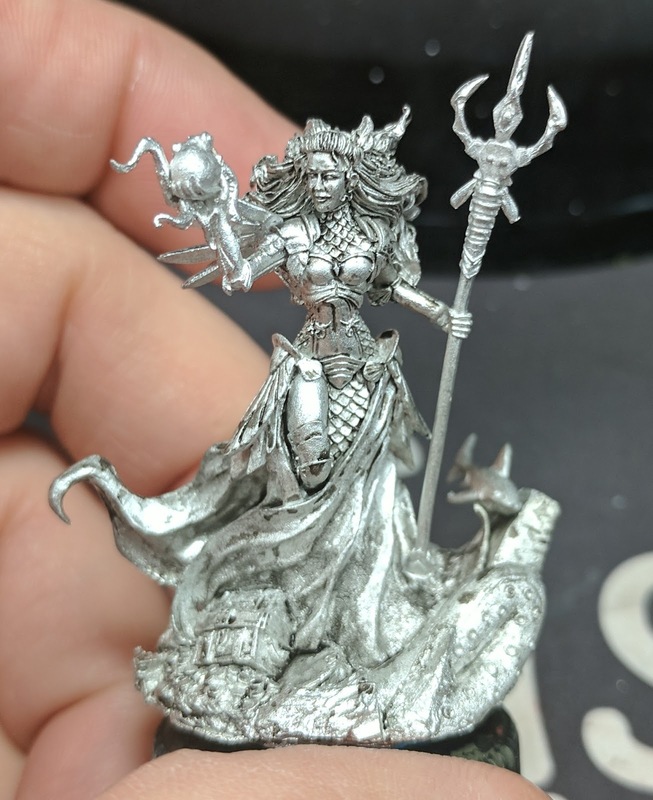 The plan going forward is to sculpt more coins and some extra tentacles, as well as hiding the gap between the pewter mini and the cork top that she's glued on to. On Sophie's recommendation, I will only be working on this during our streams. You can catch the progress live on Monday and Thursdays from 8-11pm est over on multitwitch.